North Western Road Car Company (NWRCC), a much admired part of the BET Federation, was based in Stockport, Cheshire. Operating stage carriage services principally in Cheshire, Derbyshire and the more urban parts of Lancashire in and around Manchester, it was also an important express services operator connecting Manchester with destinations such as Blackpool, Derby, Leeds, London, Newcastle-upon-Tyne and Nottingham. 796 (LDB 796) was the last Leyland Tiger Cub purchased by NWRCC and it entered service in March 1960 in the then standard dual purpose livery of black upper-works, cream band and red panels. Not surprisingly these vehicles were nicknamed “black tops” and were well regarded by passengers and drivers alike; they could be found operating a mixture of local and medium distance services throughout the Company’s operating area. 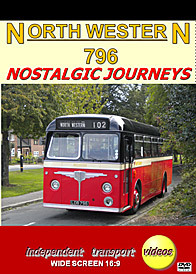 Initially, 796 was a Wilmslow based “car” (NWRCC generally referred to its vehicles as “cars”) but sister vehicles numbered 792-795 were based at Urmston depot in the early 60’s and this DVD sets out to re-create some of the services operated by these vehicles in that area of south west Manchester which embraced both urban and rural routes, some as far as Warrington to the west. The cameras of independent transport videos were there in the summer of 2011 to record scenes such as the “black top” emerging from the former depot (closed as long ago as May 1973) to take up service on route 107 which connected Eccles to Flixton. So enjoy, firstly, shots taken on part of the route of service X60, Blackpool to Manchester then a short working of route 22x from Barton Bridge to Urmston before taking in routes including 106 Flixton to Urmston and service 102 Urmston to Warrington via Lymm, which at Statham passed through one of the infamous low bridges beneath the Bridgewater Canal. The DVD closes with scenes filmed at Network Warrington’s (Warrington Borough Transport-WBT) depot where NWRCC maintained a small outstation. There, 796 is reunited with Warrington’s PD2/Special, number 148, which is still owned and operated by WBT as a heritage vehicle.